If someone offered you a “bag of nooch,” or a “sprinkle of hippie dust,” would you take it? If you’re a pizza-loving vegan, you probably would! This episode of Fresh Pickings explores the world of nutritional yeast (and reveals its various street names). Nutritional yeast is the deactivated (or dead) form of Saccharomyces Cerevisiae – the mother of all yeast strains. Dave Arnold of Cooking Issues joins Kat to teach her more about the science behind “brewer’s yeast” – how it’s grown, cultured (deactivated) to create nutritional yeast, and then packaged for our consumption. If you’ve ever tried nutritional yeast before, you know that it packs a umami punch. For that reason, it’s particularly popular among vegetarians and vegans as a way to add a savory seasoning to dishes. 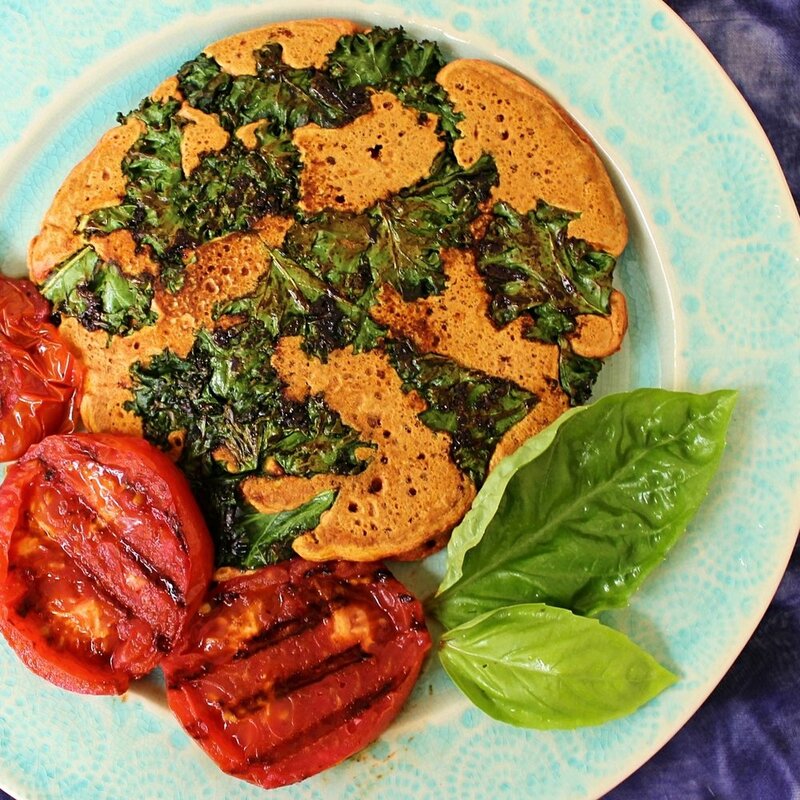 Kat welcomes back VLGL (Vegan Low Glycemic Load) blogger, Elizabeth Taylor, to share her recipe for a Chickpea Flour Omelette with Chipotle-Grilled Tomato. Begin to heat your grill/grill-pan on medium-high. Evenly brush on the oil. Slice your tomato into 1/2″ thick slices. Using your fingertips, gently rub each side of each slice with the chipotle powder and salt, and set aside on a clean plate. Combine all of the dry omelette ingredients (from chickpea flour to baking soda), and pour in the water, forming the “batter.” Whisk until no lumps remain. Add the olive oil to a small, nonstick pan, and heat on medium. Once hot, add your kale and sauté until the edges are brown and crisp, stirring occasionally, adding the soy sauce towards the end. Once the soy sauce is absorbed by the kale, place your tomato slices onto the grill, and add the batter to the pan, pouring over the kale. Leave the batter alone (no stirring) until bubbles begin to form. Then, flip your “omelette,” and turn over your tomatoes approximately one minute after. The omelette is done when cooked through; the tomatoes are done when grill marks are visible on each side. Fresh Pickings is proudly supported by Bob’s Red Mill. Music for Fresh Pickings is by Lee Rosevere. Have a Grand Time at Feast Portland’s Grand Tasting!